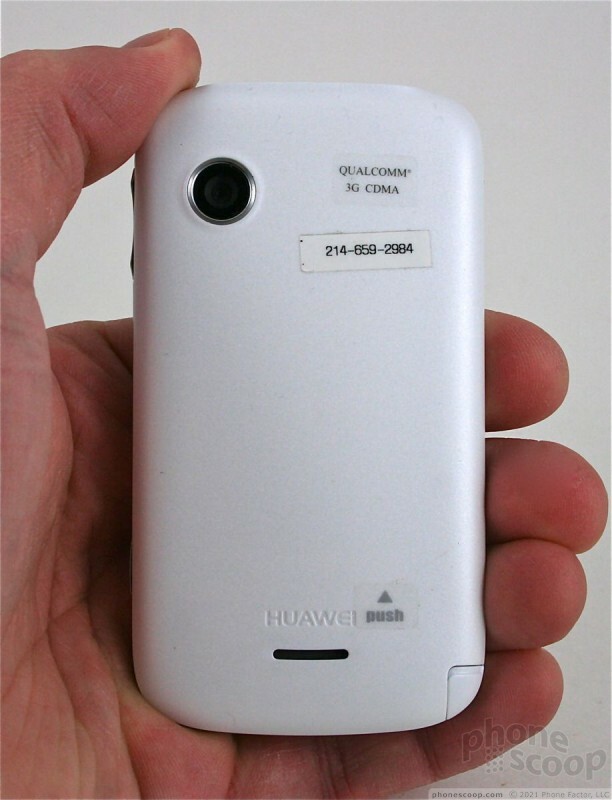 The Huawei M735 is an inexpensive touch phone for MetroPCS. While it aspires to round out the low-end of MetroPCS's portfolio, it only manages to find the bottom of the barrel. The Huawei M735 joins MetroPCS's lineup of inexpensive handsets and offers a 3 megapixel camera, touch screen and a tiny footprint. If you're in the market for a pre-paid touch phone, but don't want to go full smartphone, the Huawei M735 might be the alternative you're looking for. As far as touch phones go, they can't get much smaller than the Huawei M735. Its diminutive dimensions make it an ideal companion. It is made mostly of plastic. 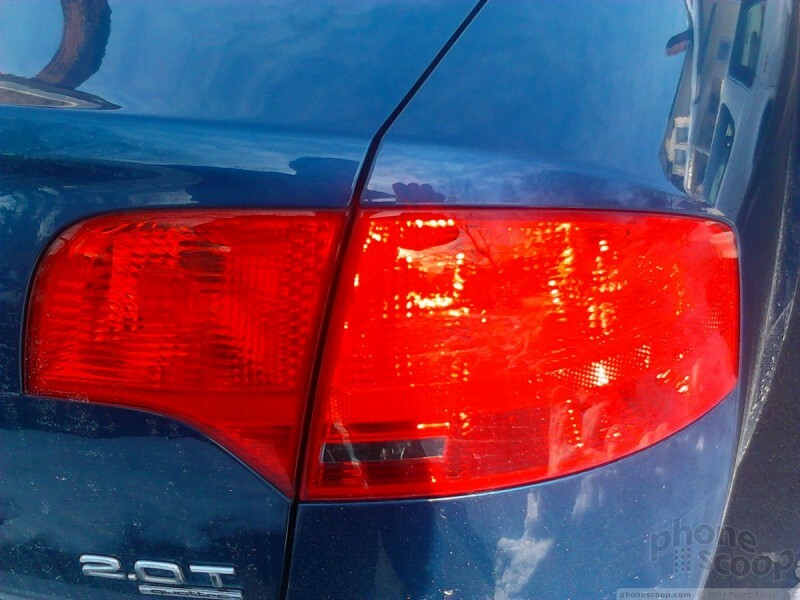 While they aren't the highest quality materials, they manage to avoid feeling cheap. The edges are rounded and smooth and the M735 is very comfortable to hold in your hand. The 735's small stature and smooth shape mean it slips into and out of pockets easily, and is light enough that you can put it there and forget about it for a while. 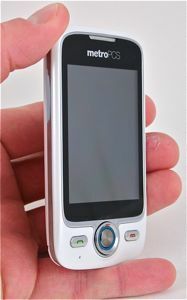 The front face of the M735 is mostly consumed by the 2.8-inch touch display. Beneath the touch display, the M735 adds physical send/end keys, where are separated by a d-pad. The buttons have a nice shape and feel to them, and travel and feedback is spot-on. The d-pad is great. It has the perfect outer ridge and the travel and feedback of the directionals, as well as the center select key, are all perfect. My only complaint concerns the d-pad's size; it is about the size of a dime. Were it the size of a penny, it might be a hair better. There are no controls on the left or bottom edges of the M735, but you will find a stylus tucked into the bottom left corner. The stylus is there because the M735 has a resistive touch panel. The stylus is easy to pry out, though I feel it might eventually not fit snugly enough and could fall out and get lost. The volume toggle is placed on the right side of the M735. I had no problems finding it with my thumb, but travel and feedback were on the mushy side. 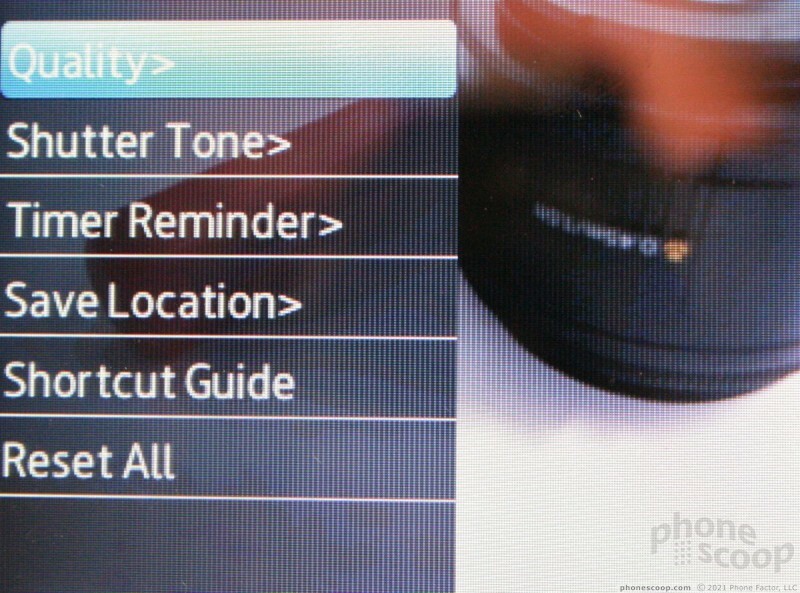 A dedicated camera button is placed below the volume toggle. It is a single-stage button. It has good travel and feedback, but I'd prefer if it were a bit easier to find. 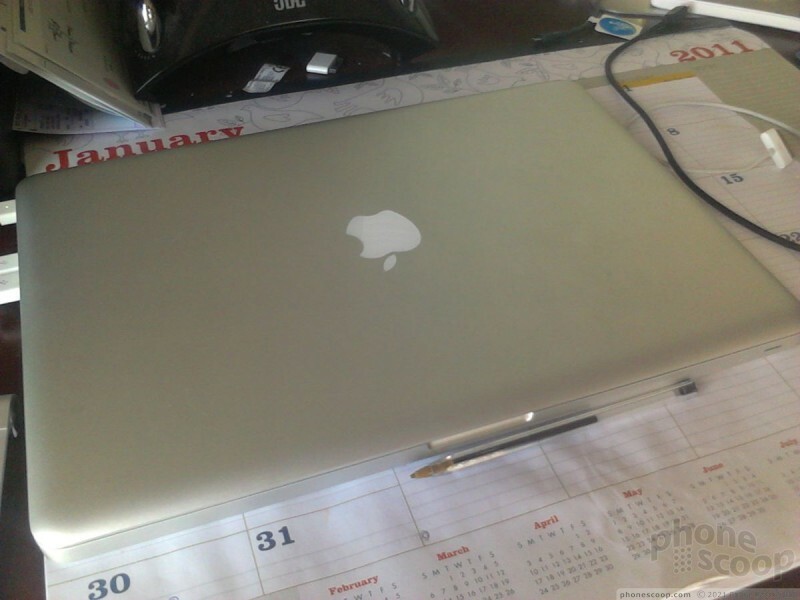 It is too flush with the surface of the M735. The microUSB port and 3.5mm headset jack are both on the top of the M735. In order to get at the microSD card slot, you have to remove the battery cover. Thankfully, the slot can be accessed without removing the battery. The M735's 2.8-inch resistive display packs in a disappointing 240 x 320 pixels. The low-rez screen may help to keep the retail cost of the phone under $99, but users will notice pixels everywhere. 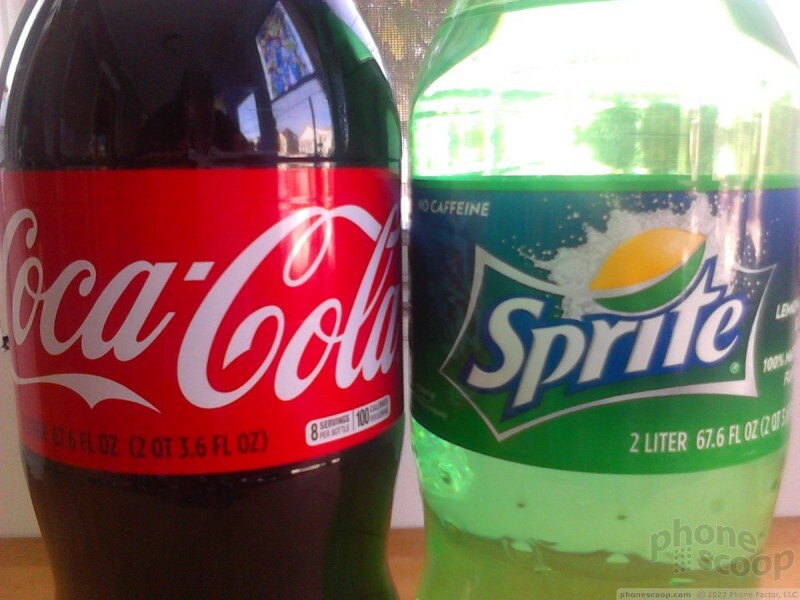 Text, icons, graphics, etc., are all fuzzy around the edges where the pixels stand out. 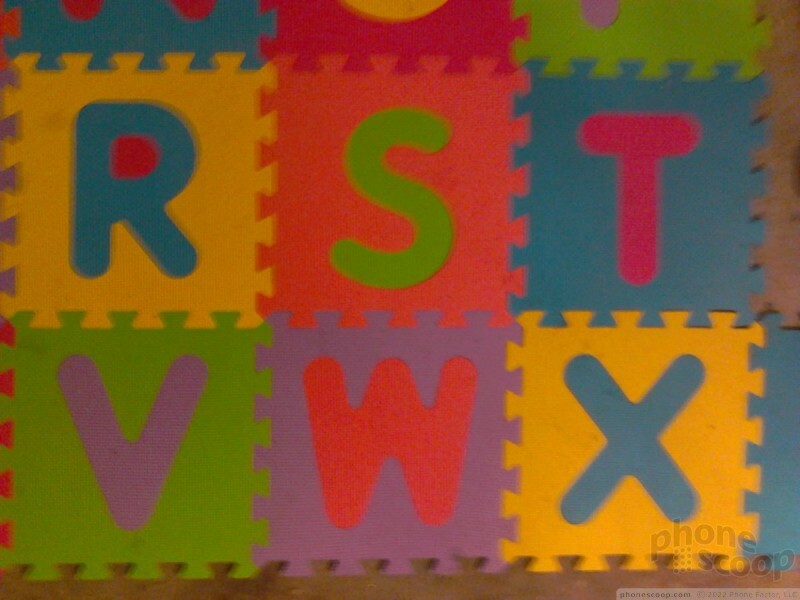 In addition to a poor pixel count, it is also a bit too dim for my tastes. Indoors it is fine when the brightness is cranked up, but outdoors the M735 is practically useless. 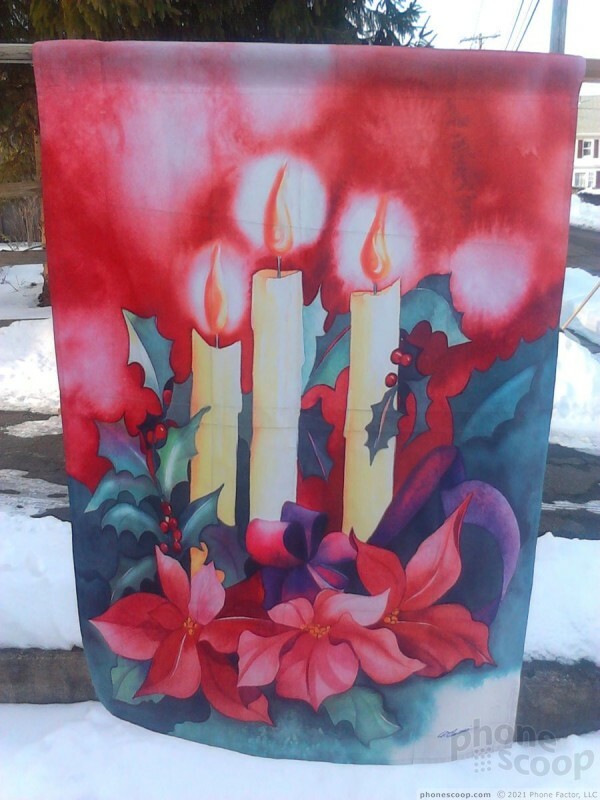 The combination of glare and light washes out the display completely. In and around my town, the M735 almost always showed a zero signal count. Calls and SMS/MMS messages zipped through with no problem, though, and the M735 didn't drop any calls during my testing period. Since the M735 supports only 1xRTT data, data sessions were frustratingly slow and often timed out. The M735's ringtones and alert tones are not nearly loud enough. It will be easy to miss calls in any environment with even modest amounts of background noise. The one saving grace is that the vibrate alert is especially strong. 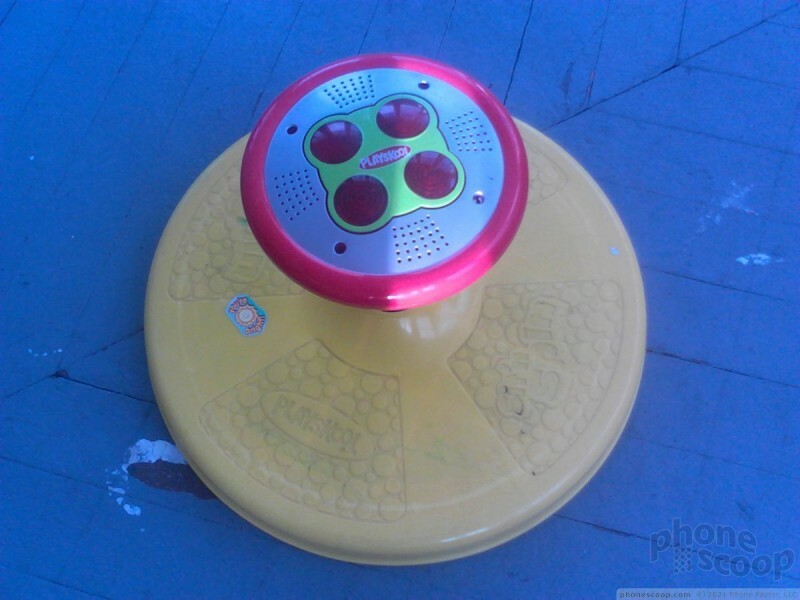 It will dance across any smooth surface when the vibrate alert is set on. You'll notice the vibrate alert in your pocket long before you hear the M735 ring. Call volume in the earpiece, thankfully, is quite loud. It's not painfully loud, but loud enough that you'll be able to hear conversations in most environments. The problem isn't the volume, however, it's the quality. Call quality was downright terrible. Calls were fraught with noises, hissing, volume irregularities and dropping out entirely for several seconds. The speakerphone is loud, but suffers from the same quality issues. The Huawei M735 is not a good phone for making phone calls. The battery does a good job of providing power to the phone. 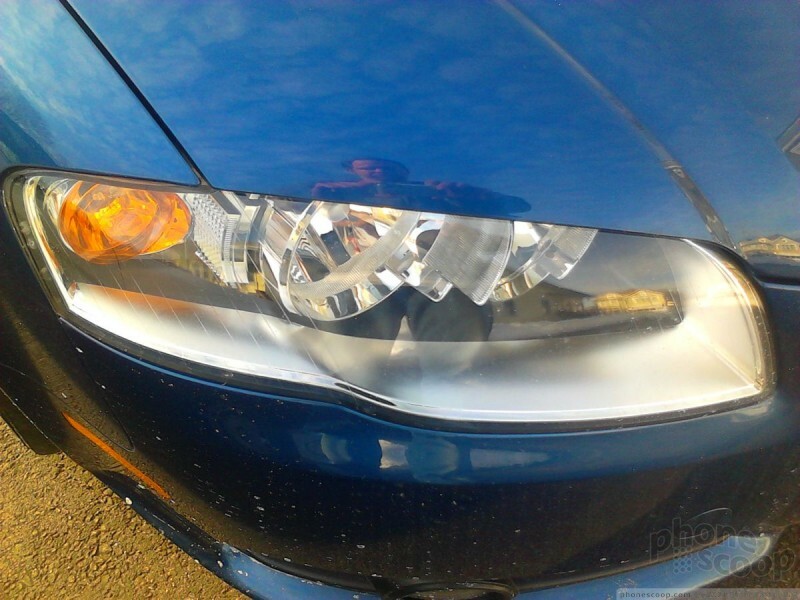 From a full charge, the M735 easily lasted through two and a half days. During my testing period, charging it every other night was more than sufficient to keep it powered up. 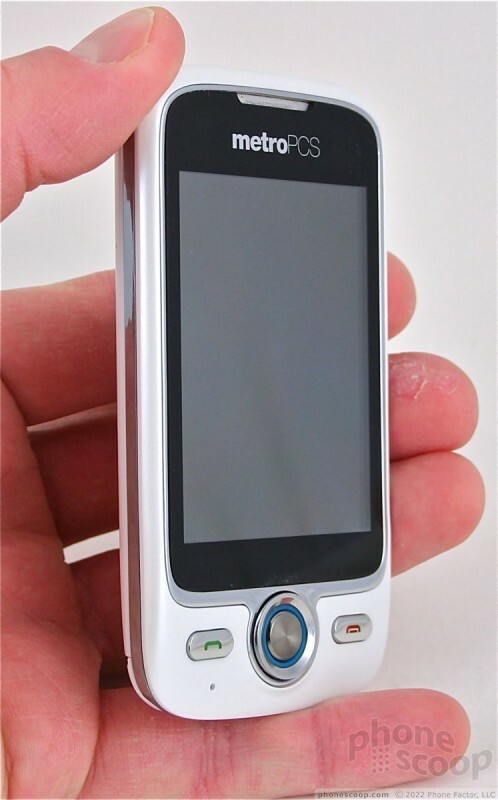 The M735 uses a custom-made user interface that feels and looks like a mash-up of Samsung's TouchWiz and LG's feature phone touch interface. 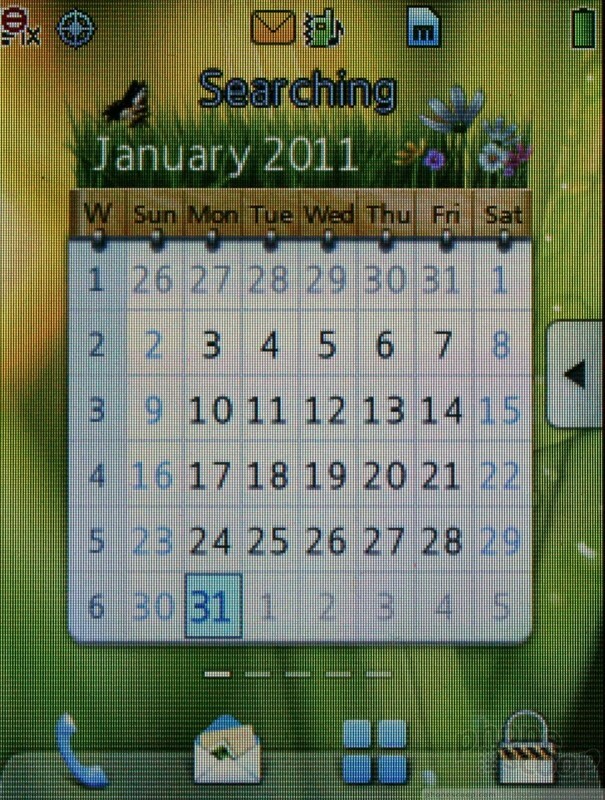 It offers five home screens that can be customized with widgets and/or application shortcuts. You an swipe left or right to get to these additional home screens, but I found it much faster to use the d-pad. There is also an app drawer on the right side of the screen accessed via a tab that works identically to the one used by Samsung in its old TouchWiz devices. With five home screens that are each customizable, I question the value of the app drawer, but it is there if you want to use it. Last, there are four permanent icons along the bottom of the home screens for accessing the phone, messages, main menu, and screen lock. The main menu is a large grid of icons. This grid view can't be changed (to a list view, for example), but you can move the icons around into an order that suits you better. Just press and drag the app icon to another spot in the menu. Once you drill down past the main grid, menus switch to text-driven lists of action items. It's not the prettiest user interface I've seen, but it is functional and doesn't impact usability in a negative way. The M735 offers several avenues towards making calls. 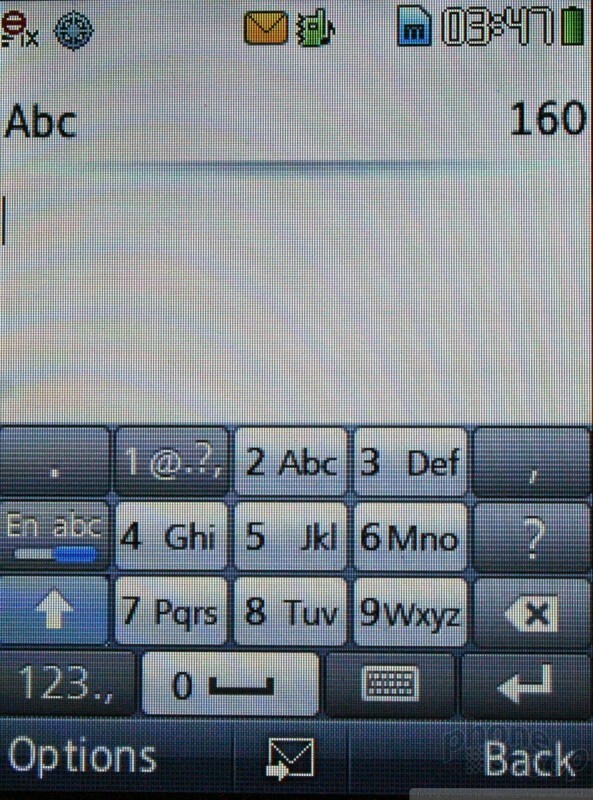 Pressing the physical send key opens up the call log. 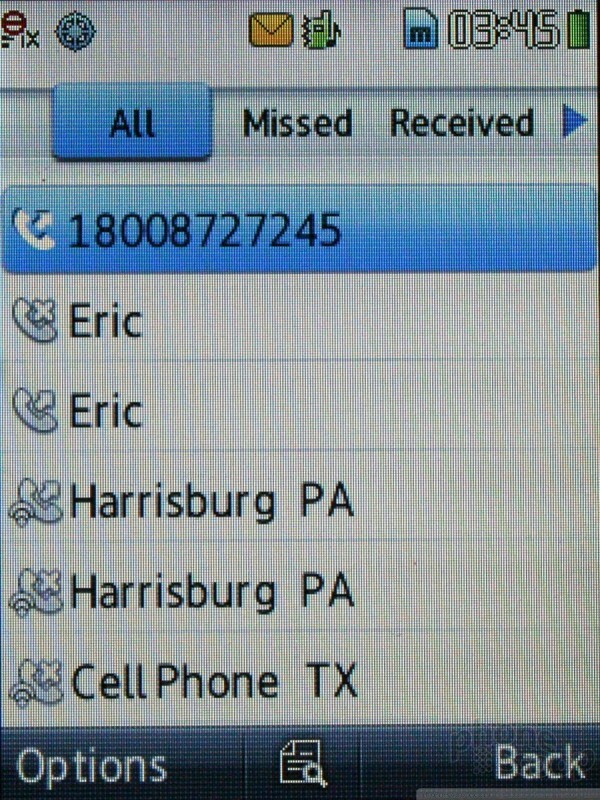 The default view shows all the calls made to/from the handset. Pressing the D-pad sideways lets you parse through several tabs, which separate calls into just missed, received, dialed, etc. From any of these tabs, press the screen or use the d-pad to select a call record. Press the send button to call it, or press the little search symbol on the bottom of the screen to get the details of that call. What's exceedingly annoying is that you can't get to the dialpad from the call log. You have to exit out and press the phone icon on the home screen. That's the only way to open up the software dialpad. I can't stand this. 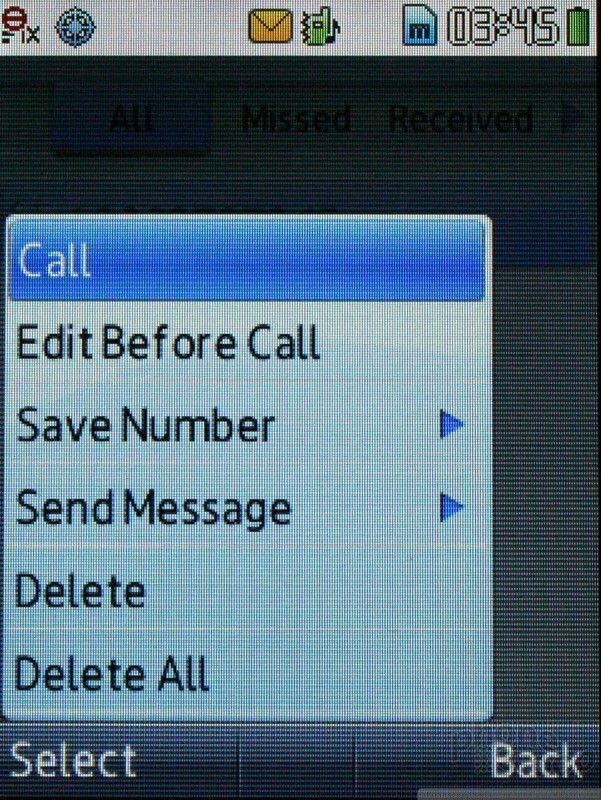 Once you've connected a call, there is an options menu for switching to Bluetooth, adding a line and so on. 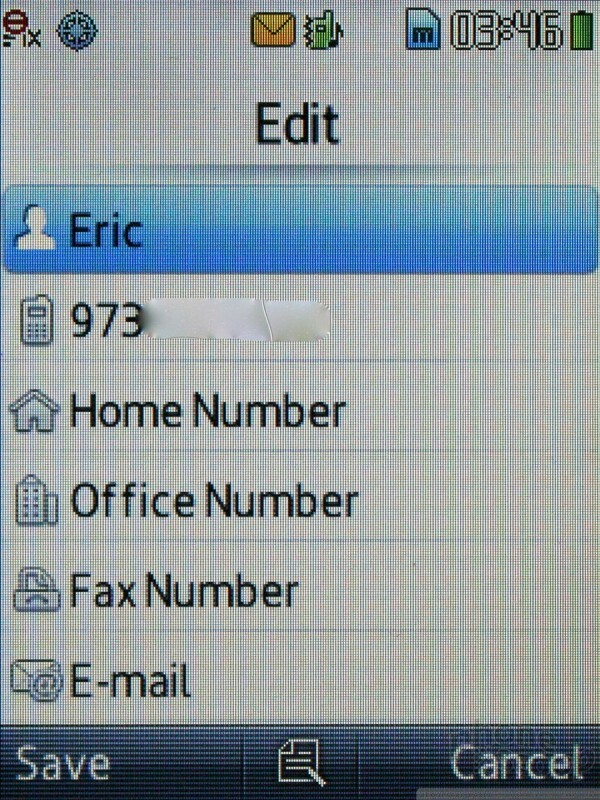 The contact application lets each contact hold at least four numbers, in addition to an email address, web site, and notes. You can't add a street address, but you can set custom ringtones and alert tones for each contact. 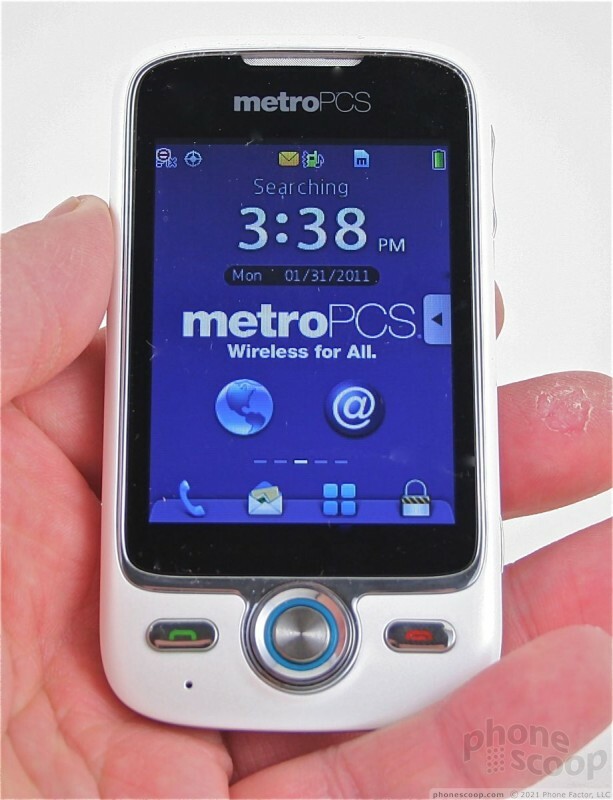 The M735 has a pretty good search function for sorting through contacts, but the only way to sync contacts to the device is by using MetroPCS's backup services. In other words, if you're switching from another MetroPCS handset, it will be a cinch to grab your contacts. If you're a new MetroPCS customer, it will take some time to add them all in manually. The M735 covers the basics when it comes to messaging. 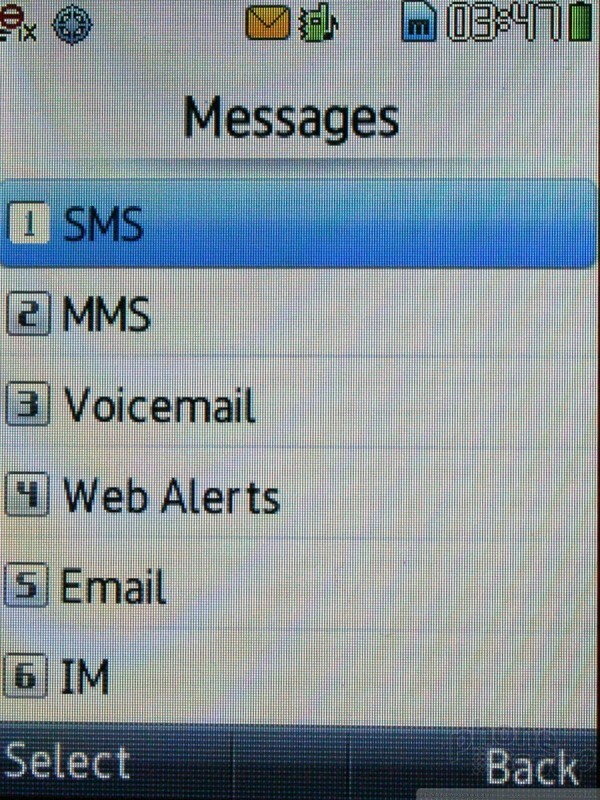 That means SMS/MMS, IM and email. The SMS/MMS application works as you might expect. All the standard tools apply. That means you have access to emoticons, text templates, and so on. One annoying quirk (and this applies to all text entry on the M735), is that the handset has a T9-style interface for adding text by default when it is held vertically. 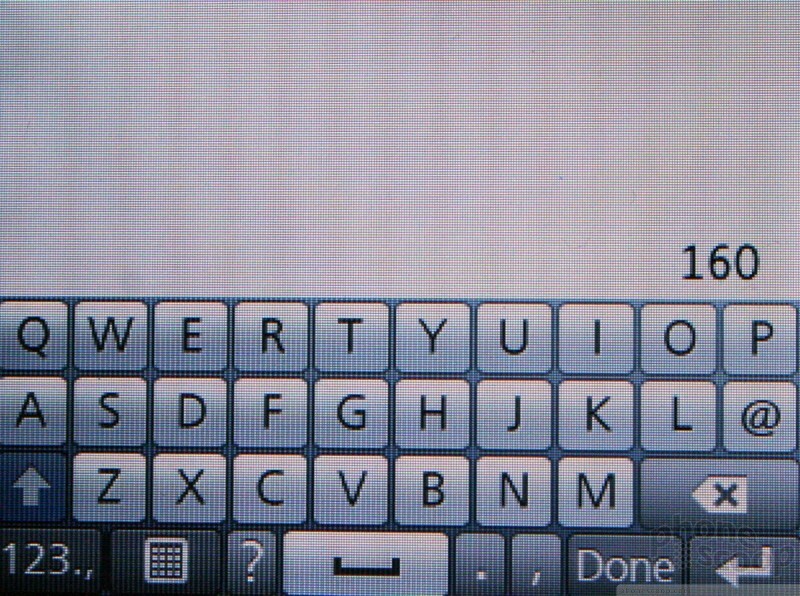 If you want to turn the phone sideways and use a QWERTY keyboard, you have to open the T9 keyboard first, and then press a dedicated QWERTY button. Worse, the QWERTY keyboard can only be used for text entry. You can't take any actions from the QWERTY screen. 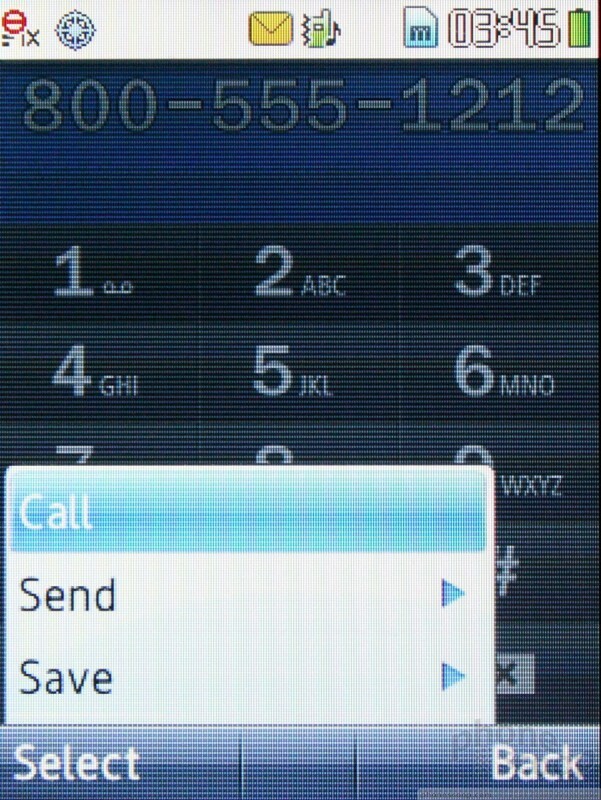 You have to press "done," rotate the phone vertically again and go back to the T9 screen in order to access the options menu and actually send the message. That's supremely frustrating. 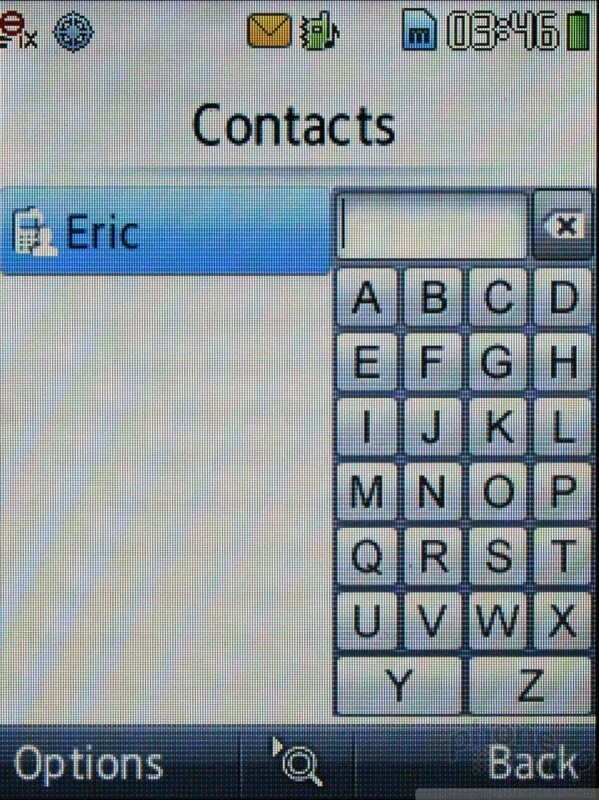 Additionally, the software buttons for both the T9 and QWERTY keyboards are way too small. This is, perhaps, why Huawei provides a stylus for the M735. Typing mistake-free messages was flat-out impossible. The email application is the same horrendous email app used on MetroPCS's other devices. It looks like an application developed back in 2001. It supports POP3/IMAP4 email systems. It pulls email down sporadically at best. The same applies to the mobile instant messaging application. It supports AIM, Yahoo and Windows. I found the interface to be clunky, the performance to be slow, and the overall experience was just too frustrating with the weak text entry tools provided by the M735. In terms of social networking, the M735 doesn't offer applications. Instead, the M735 has browser shortcuts to the mobile web sites of Facebook, MySpace and Twitter. They provide minimal functionality. I couldn't find any dedicated applications in MetroPCS's application store. 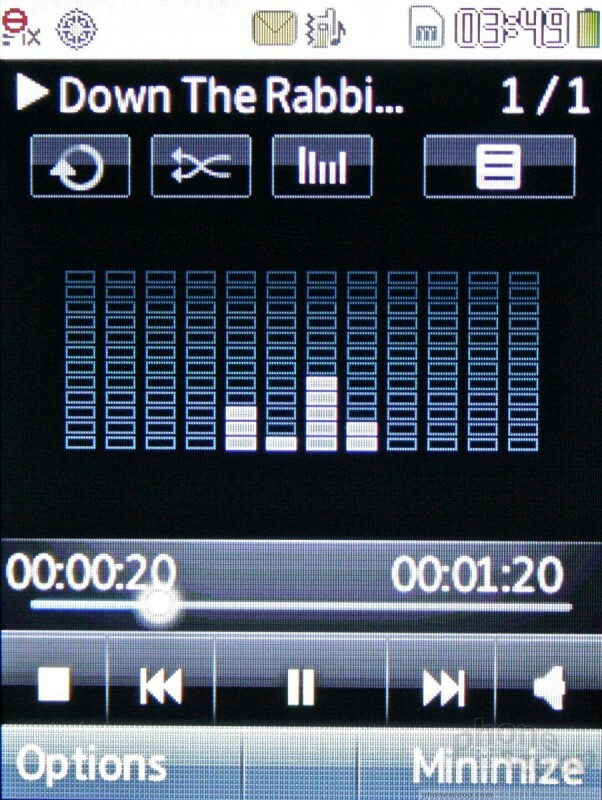 The M735 has a basic music player on board. There are no music stores or access to music apps on the device, so you'll have to sideload music onto a microSD card first. Be careful, however. You have to put music in a special folder (My_Music), otherwise the M735's music player can't see it on the microSD card. Once you've loaded music onto a card, inserted it, and refreshed the library, you'll have access to all your songs on the M735. In what has to be the most frustrating thing I've ever encountered in a mobile music player, you can't play any of your songs unless you "check" them first. 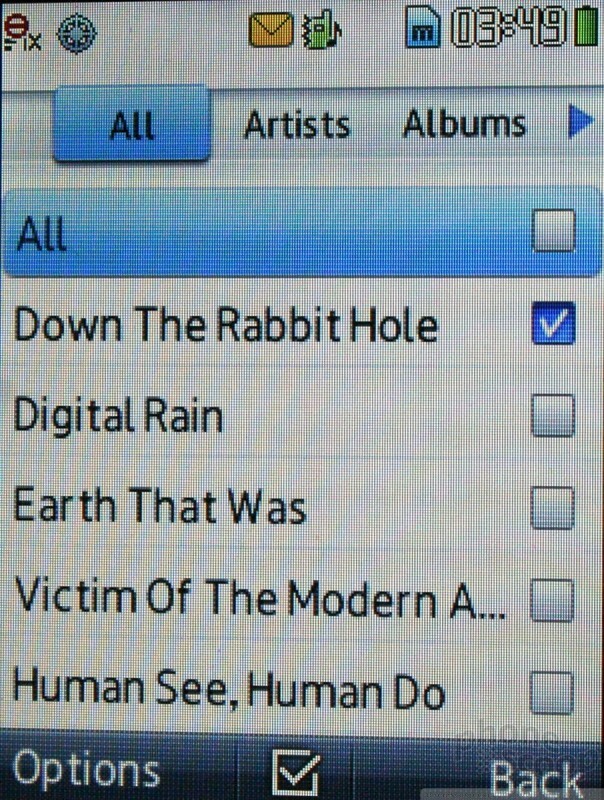 You have to go through and place a check mark next to each and every song if you want to have access to it in the media player. Unreal and absolutely ridiculous. What if my library is 1000+ songs? The player itself is on par with other feature phones. It can shuffle or repeat music, it can skip forward and back, it offers several pre-set EQs, and offers several different skins. Even though my music has properly tagged album art, it never showed up. 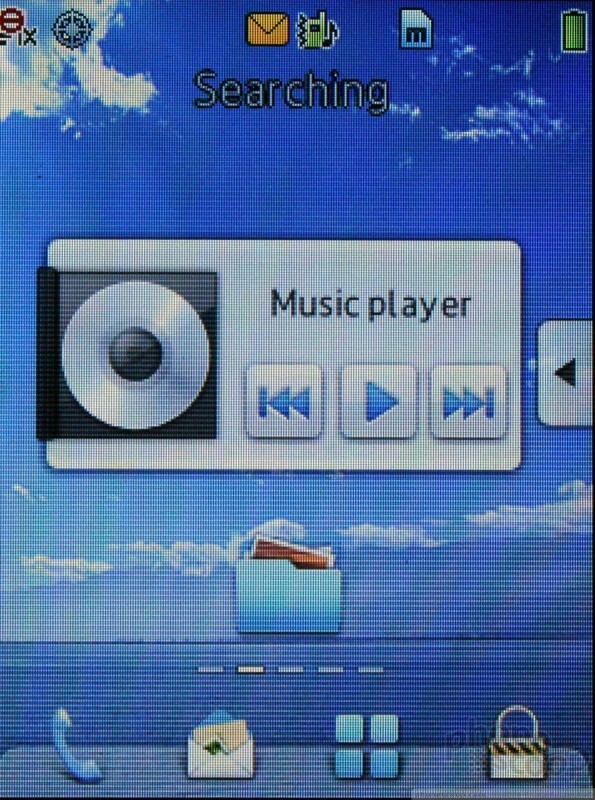 There is also a music player widget on the home screen that can be used to control the current play list. All it does is play/pause and skip forward/back a track. Music sounds pretty good through the the speaker and good through headphones. Its power is limited, though, and I couldn't get my earbuds loud enough for my tastes. 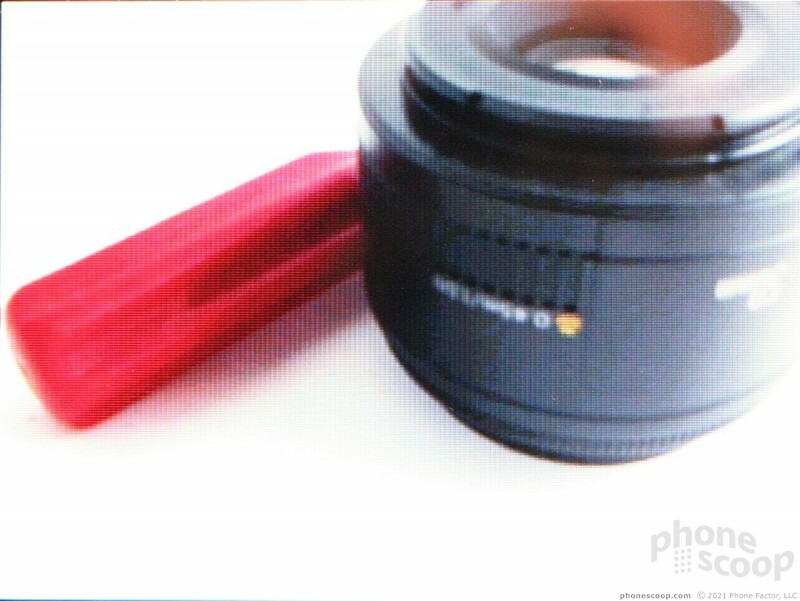 The M735 has a 3 megapixel camera and a dedicated camera button with which to control it. The software controls are quite easy to use. The camera application opens up in about two seconds and takes you straight to the viewfinder. You can snap off pictures right away if you wish. When the app first opens, you'll also see a set of icons that run along the top and bottom of the display, but they disappear after about three seconds. These tools let you make adjustments to the camera's settings. Rather than open individual menus or drop downs, pressing any of the icons cycles through whatever options are in there. For example, want to change the resolution? 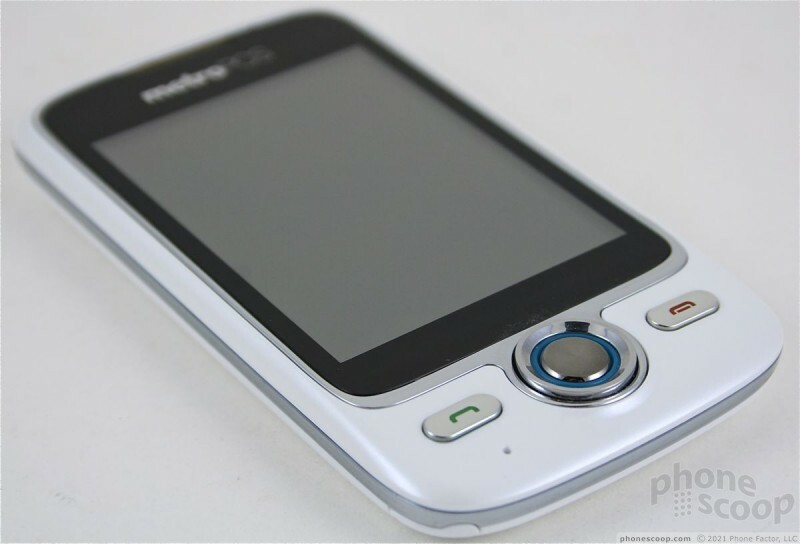 Start pressing the resolution button and it dials down to 2MP, 1MP, .5MP, .3MP and then back to 3MP. The same behavior applies to any of these controls. These controls, unlike the rest of the camera UI, respond very slowly. Only the "settings" button opens an actual menu, but it is poorly thought-out. For example, the M735 is held sideways for imaging. Open the settings menu, however, and you have to rotate the M735 back to vertical orientation to make adjustments. That's just dumb. 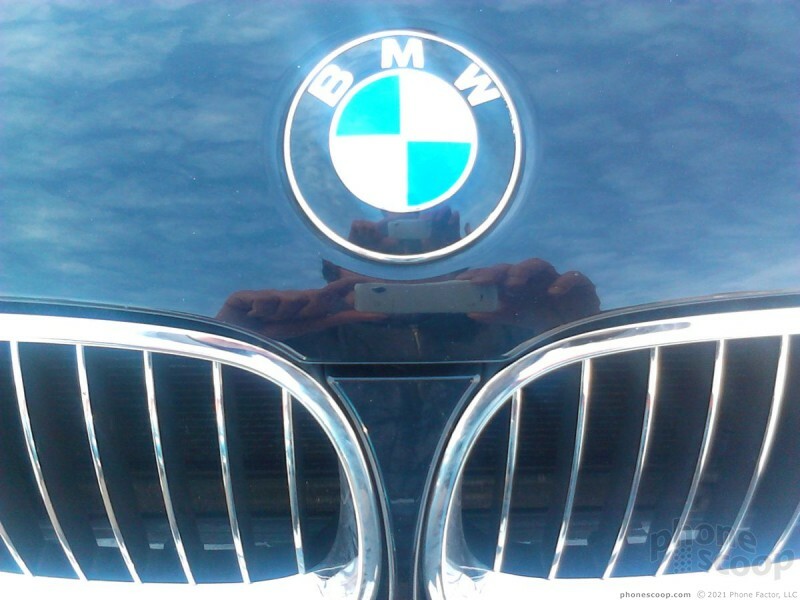 In its favor, the M735 takes pictures very fast. It also saves images quickly. Even though it takes you to a review screen before going back into shooting mode, it happens fast enough that you're not screaming in your head at the phone to hurry up already. The M735 doesn't capture video. The gallery is a near utter failure. It opens and operates very slowly. 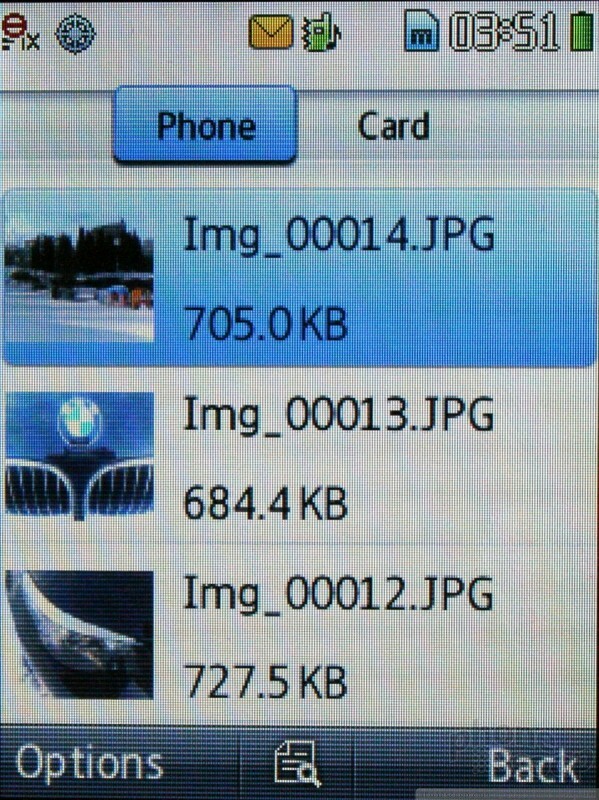 It shows a list of file names with a thumbnail next to each. 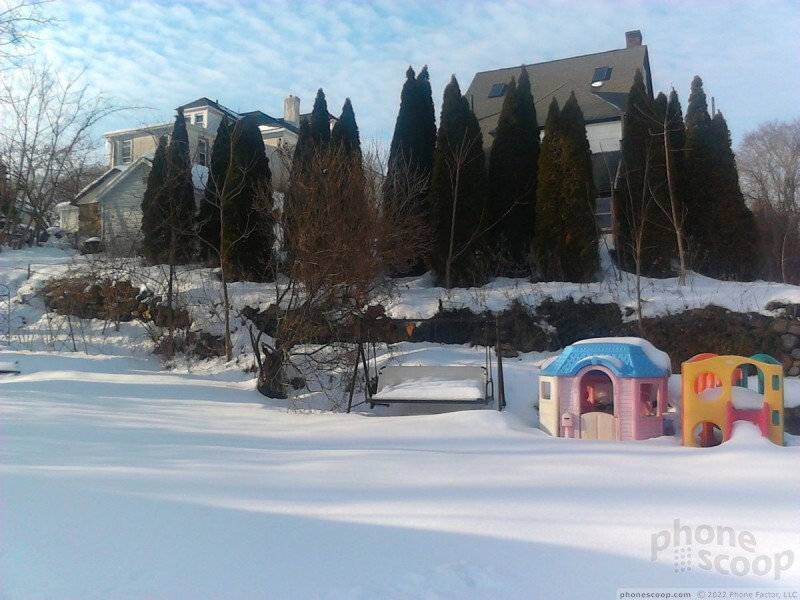 Extensive image libraries might take several minutes to load into this page. The M735 separates the libraries into what's stored on the phone memory and what's stored on the memory card. Press any of the images to open it. Here's what kills me. The default viewing mode shows the image in portrait mode with tools available via on-screen buttons. Choose the "full screen" mode, and the M735 blacks out the tools and file info. Even though you've asked to see images in "full screen", they remain in portrait orientation. This is so maddening. The M735 doesn't have an accelerometer, so turning the phone sideways does nothing. 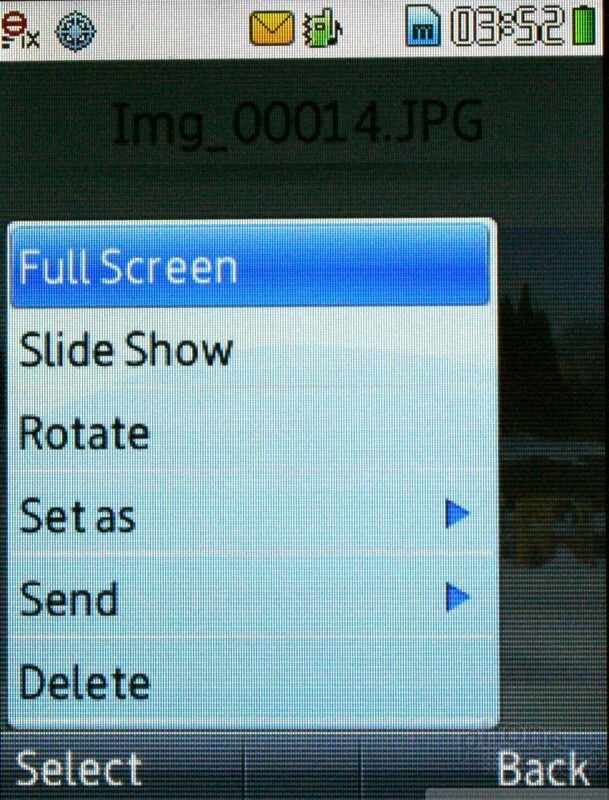 If you want to see an image fill the entire screen, you have to manually rotate each image using the software tools. 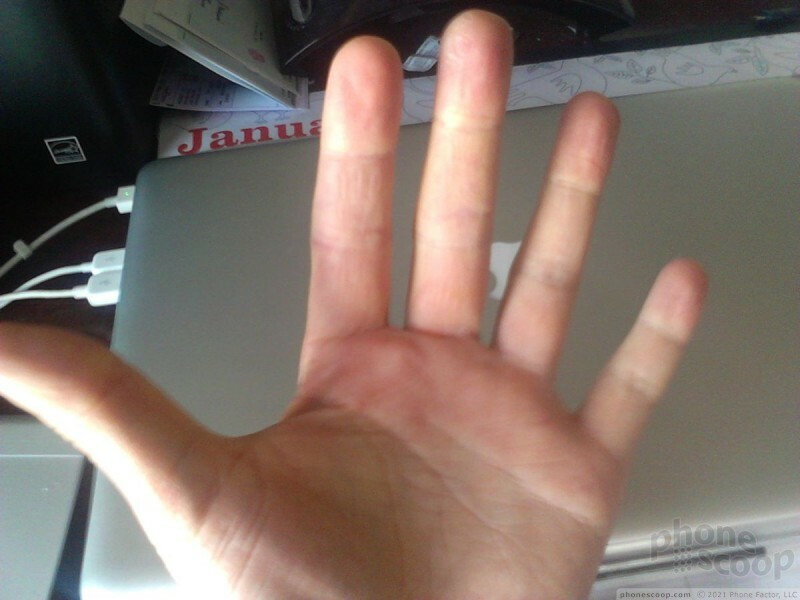 It also offers no editing tools. 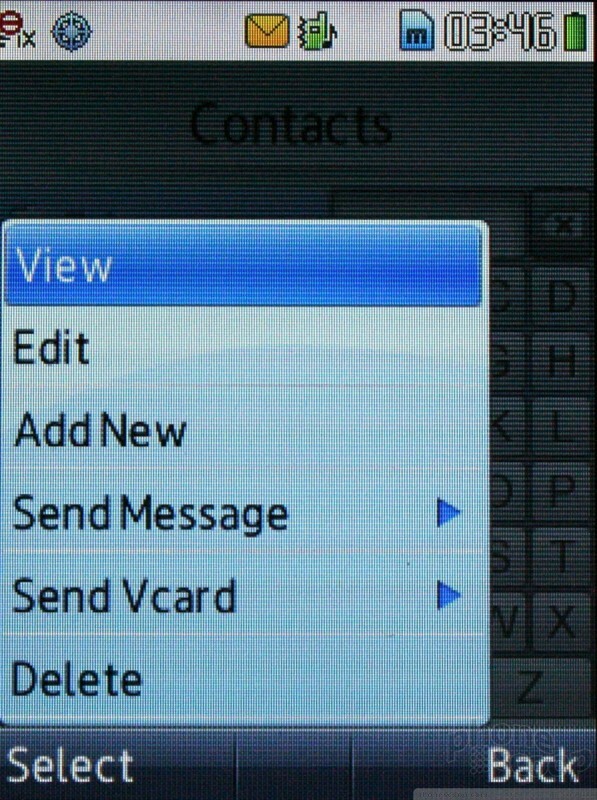 All you can do is send the pictures off via MMS or Bluetooth, or set them as wallpaper or a contact ID. 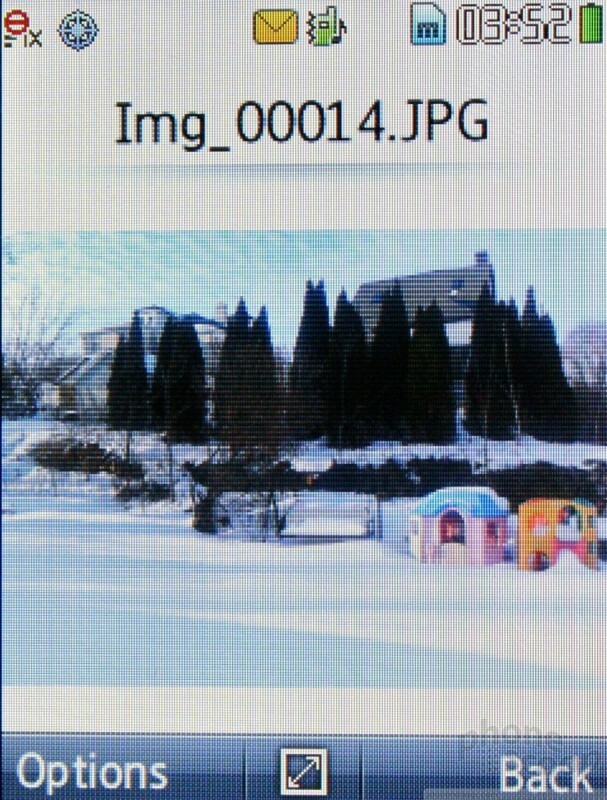 The M735's 3 megapixel camera does OK outdoors in bright sunlight, but it performs quite poorly inside. It has no autofocus, nor a flash. Most images have a fair degree of grain, and the darker the environment, the worse it gets. 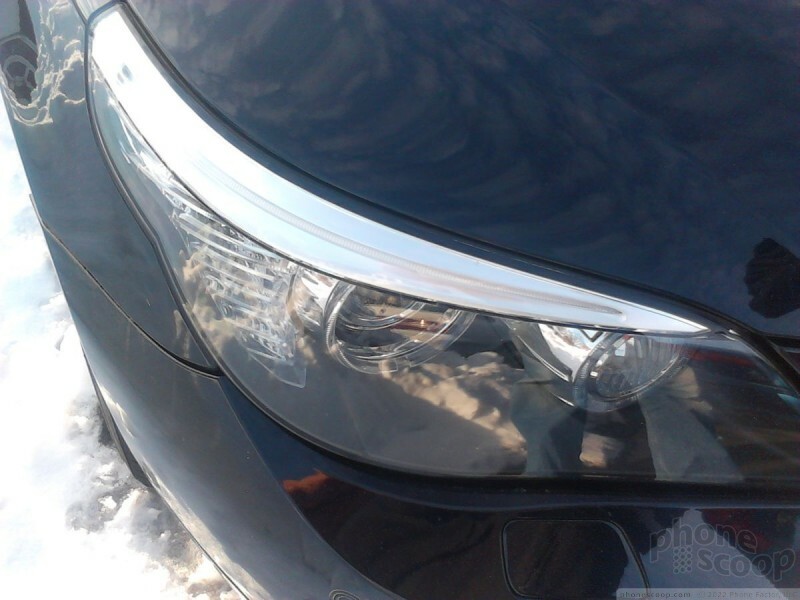 Focus is soft throughout, and it rarely produced a sharp image. 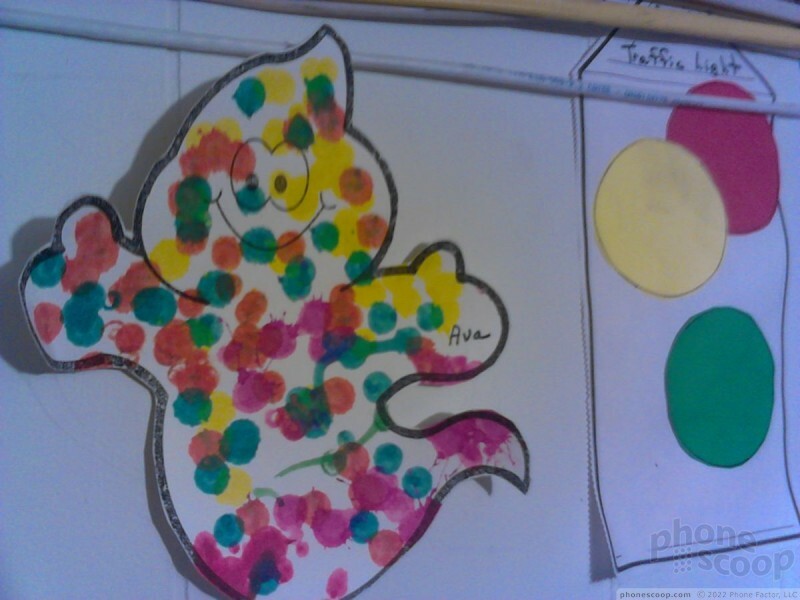 Color was represented accurately, and white balance was right more often than it was wrong. The M735 will make an acceptable MMS machine, but I'd be hesitant to share photos anywhere else. 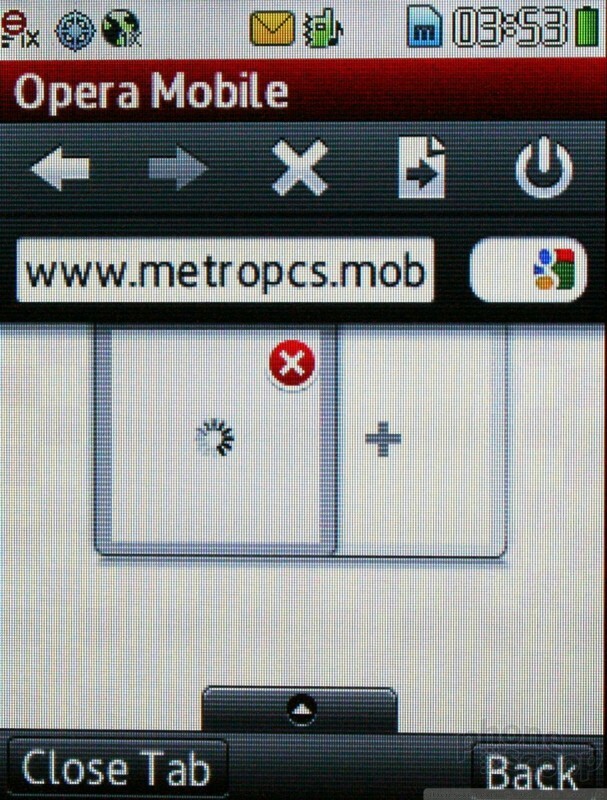 The M735 ships with Opera Mini on board. Even with Opera's page compression helping out, web performance is very slow due to the pokey 1XRTT network. It is so slow as to be nearly useless. Sites as simplistic as Google.com took nearly a minute to load. More complex web sites, such as CNN.com mobile took longer than two minutes. Many sites never finish loading, they just time out, so you get half a web page delivered to the handset. 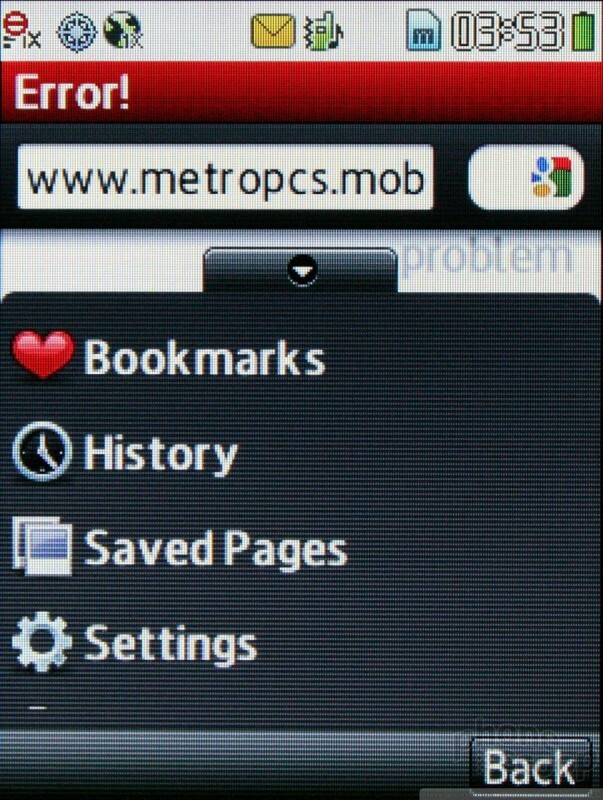 MetroPCS worked with Opera to make an Opera Mini optimized version of its home screen. That means it actually works well with your finger. But it is inconsistent. All of the MetroPCS-branded pages are perfectly designed for touch screen use, but most other web pages are clearly not. The MetroPCS home page includes a number of links to other destinations (Facebook, Twitter, et al.) 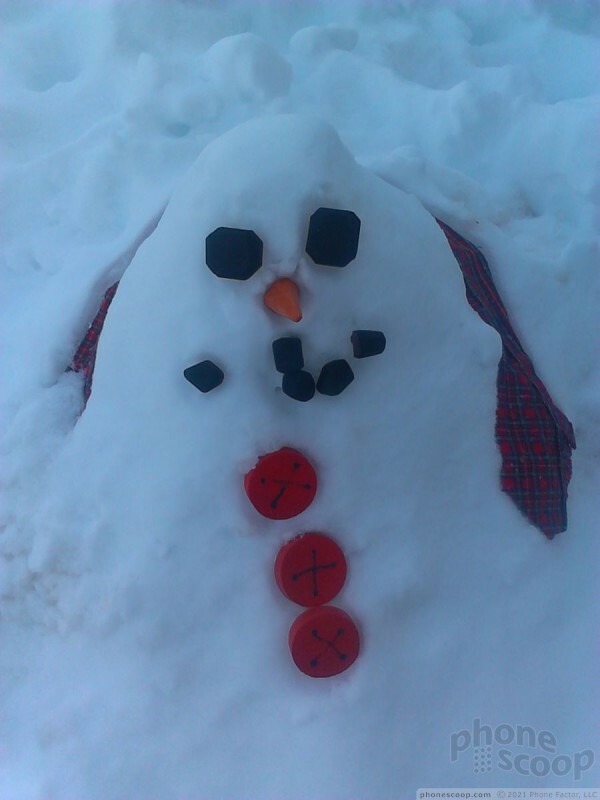 as well as generalized content (sports, news). You can also use the typical Opera Mini tools to jump to other pages, sync with your desktop, and so on. It will render HTML web sites, but poorly so. Almost all web sites are so tiny as to be unreadable. You have to zoom in significantly. Thankfully, zooming in isn't as painfully slow as loading sites in the first place. As mentioned earlier, the five home screens of the M735 make it somewhat flexible. 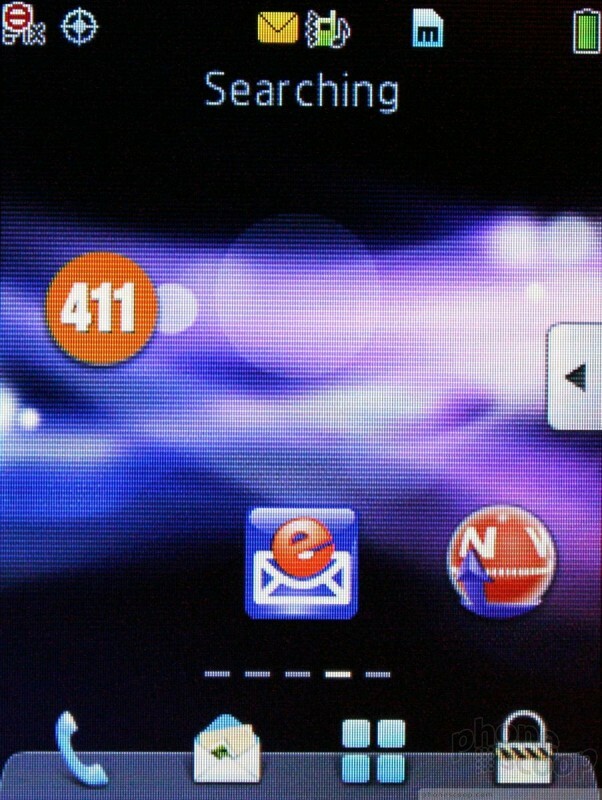 Users can arrange what limited apps and content there is for the M735 on those home screens, as well as manipulate the app drawer. The main menu can be rearranged, but the basic appearance can't be altered. 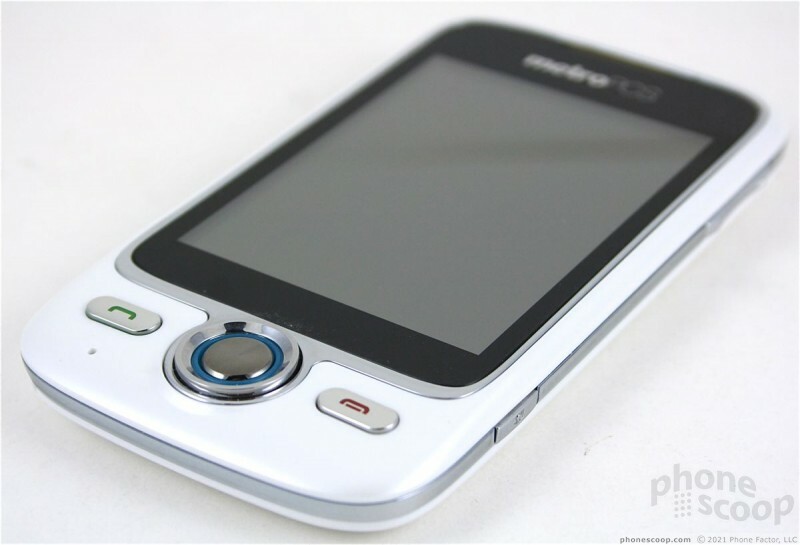 Beyond that, the M735 lets users change up ringtones, alerts, wallpapers, theme colors and so on. 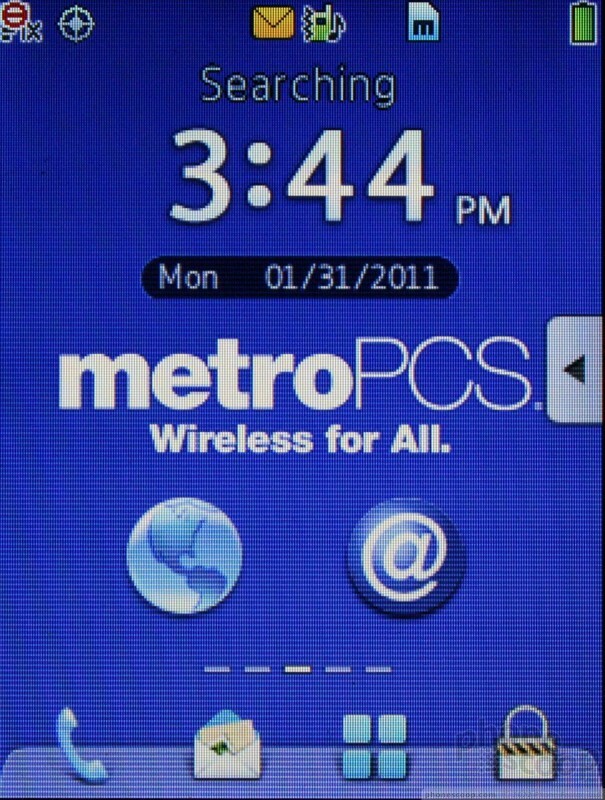 The M735 has access to an app store provided by MetroPCS. 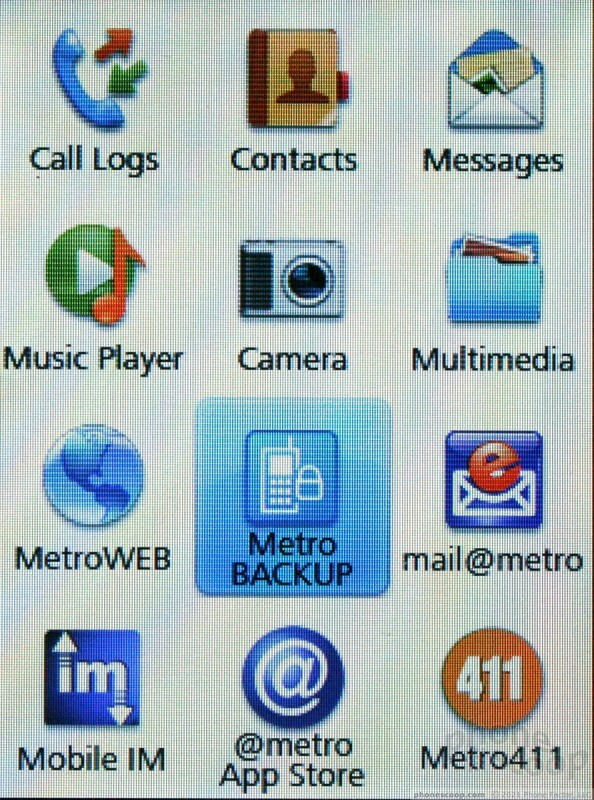 Most of the apps available are additional MetroPCS services and are limited in scale. App discovery is a terrible experience that requires digging and digging and digging through page after page after page of options. The M735 supports both mono and stereo Bluetooth headsets. I had no trouble pairing to a mono headset, but for whatever reason it wouldn't pair/connect with either of my stereo Bluetooth devices nor my PCs. Call quality through mono headsets was about the worst I've ever heard. The M735 has a good-sized digital clock that's visible on the lock screen once the display is woken up. It might be hard to read at arm's length thanks to the low brightness level of the display, and isn't readable when outdoors. Any time you are inside, it will suffice for checking the time. The clock can't be turned into an analog clock, but it can be turned into a weather widget or off entirely if time doesn't overly concern you. 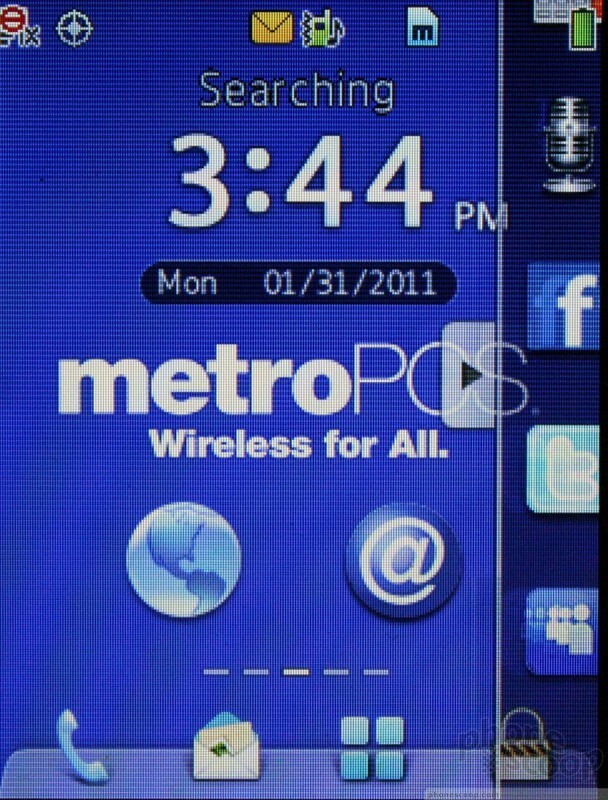 The M735 also has MetroPCS's GPS-based navigation on board. The GPS worked well at pinpointing my location, but the slow data speeds really limited the usefulness of this service/application. The M735 simply couldn't respond fast enough to changing conditions. It would take forever to redraw maps, and by the time it loaded a map it would have to load a new one because I had traveled beyond the boundaries of the map. The best feature of the M735 is the physical form of the phone itself. It's small, light, and has well-placed controls that are good to use. Once you turn the phone on, things sort of head south. Signal performance was poor, and sound quality of phones calls poorer. Battery life was OK, but the display has low resolution and isn't bright enough. Text entry is so awful that using the SMS and email applications is painful. The media player requires way too much work with little payoff, and the camera software, while well-conceived, is too slow for frustration-free use. Add to that a slow browser, poor image quality, maddening app store, and no social networking apps, and what you have is a mess of a phone that I can't recommend to anyone. 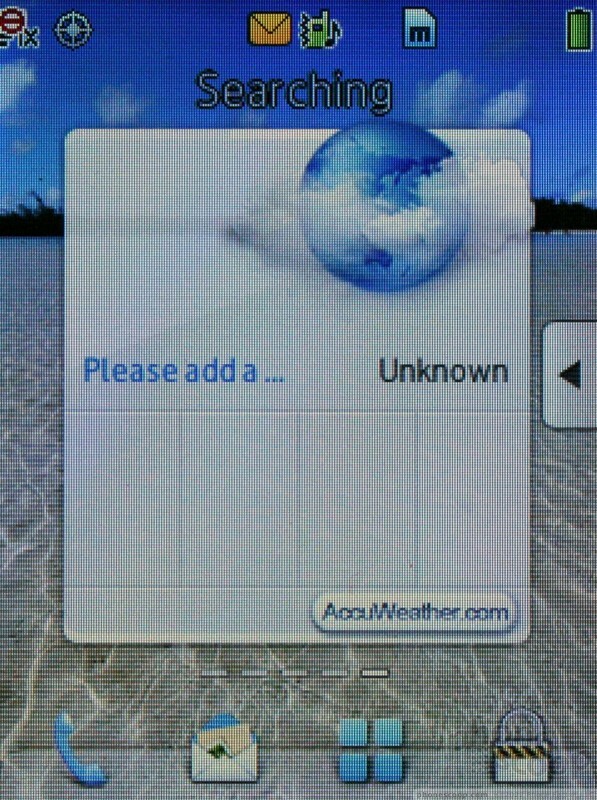 I think you a little harsh on this phone. This phone isn't designed for the phone techies, or even mid-range users. 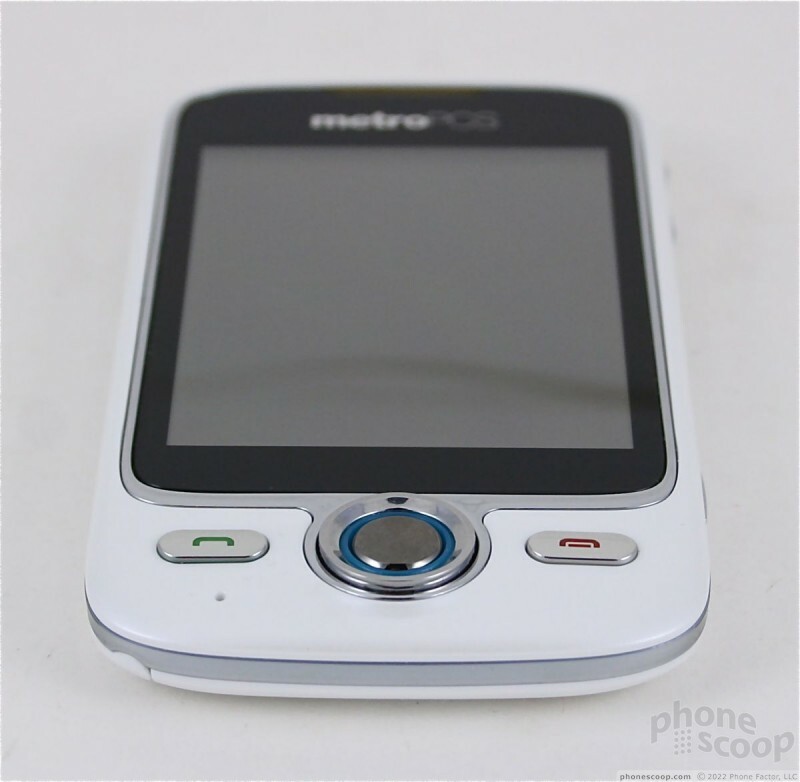 This is the phone that Metro put on its network for the parents of teenagers everywhere who don't want to blow more than $100 on a phone. It's got a touch screen, mobile browser, and music player. The youth market doesn't care about useless things like call quality. As far as your experience with browsing on 1x, I think there may be slow rendering on this device. I use it on my Optimus M and it's relatively fast considering.